March 29, 1950, more or less: a cartoonist’s impression. Gordie Howe was in Toronto this week, helping to raise money and awareness for two worthy causes: the Gordie and Colleen Howe Fund for Alzheimer’s and the health sciences centre at Baycrest. At 84, Howe was meeting people and chatting, but not talking to the media. His eldest son was, Marty, and he discussed his dad’s brain and the toll it’s paying for a long career in hockey. As the family has already disclosed, Howe senior suffers from “mild cognitive impairment,” which includes memory loss and trouble finding words. Such is the strange place in which hockey finds itself these days that the question of the day was whether the family plans to donate the senior Howe’s brain for scientific study after his death. As reported in today’s Globe and Mail, the answer from Marty was a no, um, not something we’ve really talked about so far. Teeder Kennedy’s stick caught me under the right eye and scraped the eye. It also broke my nose and cheekbone. And that’s when I went into the boards and had the serious concussion. Complications set in and I had trephine surgery to relieve fluid on the brain. So that’s one. Marty Howe also recalled (two) that when he and brother Mark were playing with their dad in New England in the WHA, a teammate icing the puck hit Gordie in the back of the head and concussed him. 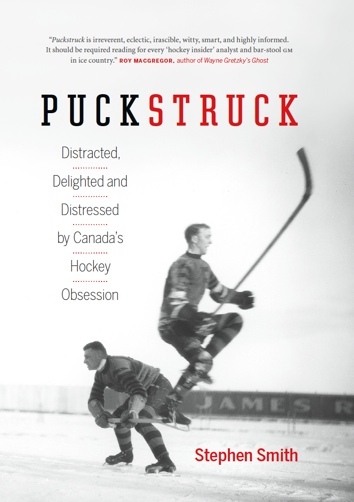 A further few, from the archives: in January of 1961, against Toronto, Howe was reported to have suffered a “mild” concussion (three) when he collided with the Leafs’ Eddie Shack — that and a gash over his right eye that took ten stitches to close. 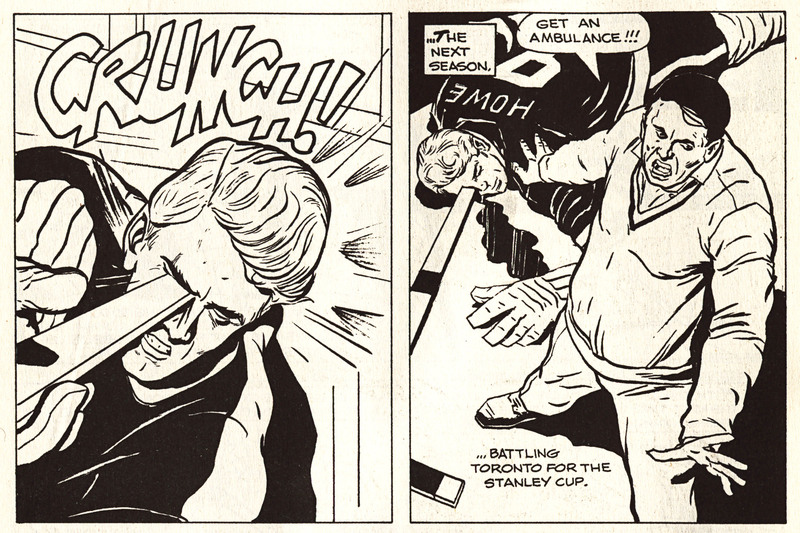 In October of 1964, in an exhibition game against a team combining players from two of Detroit’s farm teams, Howe suffered a “slight concussion” (four) after he was “knocked groggy” skidding into a goalpost. about three feet, and banged into the boards. Howe could be playing in the big leagues until his sons, Mark and Marty, develop enough skills to join their father on the Red Wings. Would Gordie ever discourage them because of the rough and tumble that caused him a concussion, broken legs and the loss of several teeth? Not a chance of that. What Howe says speaks for the kids in Princeton, Lynn, and Minneapolis and all points east, west, north and south.